So you love Spain, love tapas and love wine… but you’re stuck in Sydney. What do you do? Head down to a little tapas joint and go through several tapas dishes! Now Extra Virgin Fine Foods is a beautiful tapas place in Crows Nest which do a mix of Spanish / French tapas with a bit of flair. It’s a raining mid-week night, so warm comfort Spanish food is made for this night! The courses are brought out simultaneously and the focus (as you would imagine with a tapas bar) is on mini share plates. This dish is a simple starter which pairs the oily smooth Serrano ham, the crunch of the grissini to create a mini “heaven in mouth” sensation! 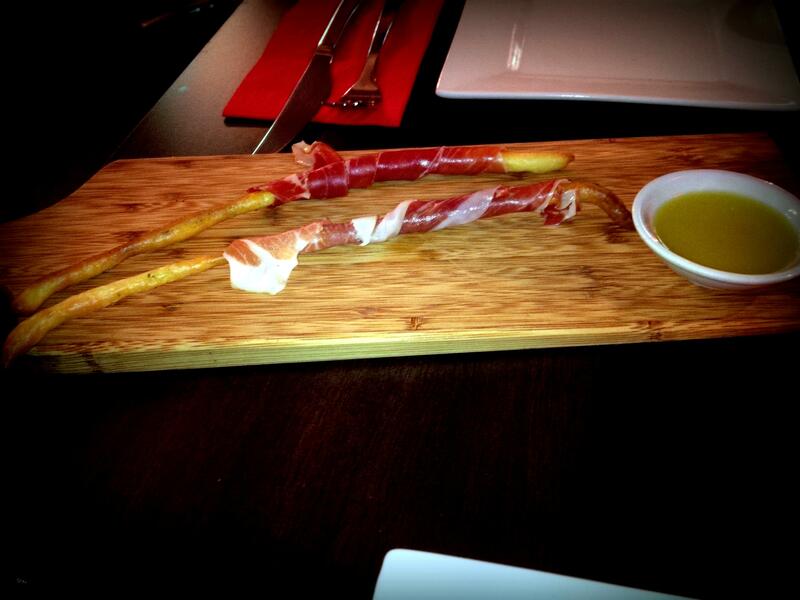 The pungent oil from the Serrano ham oozes onto the grissini… it’s amazing. It’s crunchy, smooth and the waft of rosemary adds to the dining sensation. It’s a lovely way to start the night! The light salt and citrus adds bite and tang to the tender fresh flavoursome kingfish. It’s simple produce, doing its thing. Now this dish looks simple… but let me be honest – it’s lovely. The smokiness of the vegetables is amazing to taste as is their light soft fall-apart texture, while the distinct taste of the Haloumi kicks in to just brings the dish together. This dish is the “Texture’s Dish”. The crunch of the fried crumbed coating makes way for smooth creamy inner filling of the croquette. It offers this beautiful contrast while the thick tomato based sauce on top and the rich creamy saffron aioli on the base that just makes you feel “like u just don’t care bout anythin else”. It’s a moment in time dish!! This is a lovely side, the crisp skin of the potato covering the soft potato “flesh” again provides an amazing mix of textures. The real gem in the dish is the spice from the salsa and piquillo which is rounded out with the lovely saffron aioli. The spice and juices from the chorizo interact well with the apple yoghurt. To be honest I am not a huge fan of chorizo (it’s not the dish it’s me), so I leave most of it. These sliders really are something!!! The soft buns provide a nice start to the experience with the distinct haloumi flavour making an appearance before the juices of the patty start flowing to provide a full flavour experience. Then the tangy kick of the tomato flows through to add a little bite and round out the burger. Love this! It’s tender, juicy and just fires on all cylinders. It’s not overcooked, the juices flow beautifully and the interaction of the salsa mojo for additional flavour kick – it’s truly an amazing experience. It’s the best dish of the night by far! The crunch of the outer coating is greeted with the soft gooey inner batter. There is the sugar coat and a little taste of something different (presumably the saffron). It is dipped in a rich thick hot drinking chocolate… It’s a mouthful of happiness. It’s oh so good… I love it. I can’t describe it, you got to try it yourself. Pure Amazingness. For drinks, glasses of sangria and Tempranillo and a lovely French Cabernet Sauvignon flow through the night. It’s such a lovely evening. This is certainly a little hidden gem of a place – great service, good food, amazing experience! If tapas really take your fancy – check-out another tapas joint in the city here (Tapavino by Life of a Travel Czar). Did you dine as a guest or did you pay your own way? Yes, I paid for the meal & drinks myself. All of my reviews / experiences on this site are paid for. Thanks for your reply and yes, I enjoyed the review, lovely photos too.